Dallying In The Dirt, Issue #220--- There is great joy this week. There is much joy in life this week. Many of you may remember a few issues of “Dallying” in October and November that mentioned our newest Granddaughter having to spend some time at Sick Kids’ hospital in Toronto. 7 months and 12 days later, Matilda came home this week. She is healthy and robust, if a bit tiny, but we all look forward to a healthy and happy life for her. There will be some more short visits to the hospital to fix a few lingering problems but this is really a very good news story. I have to mention Ronald McDonald House again, as it has been home to my daughter for all of that time, that facility and its paid and volunteer staff have gone out of their way to make a very difficult time as easy as it possibly could be. Thank You. Now back in the garden, where I have been absent for a few days. 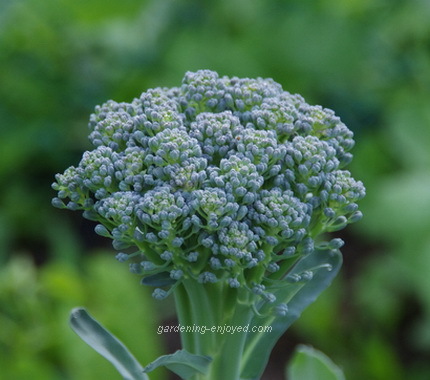 It is the busiest time of year, of course, the warm weather is here to stay and there are many things sitting on the deck and in the cold frame, waiting their chance to make it into the garden. It has not rained here for a few weeks, the rain barrels have been empty for a while and I think my arms are getting longer from carrying heavy buckets of water trying to keep things alive and growing. To alleviate the problem, I did complete a long delayed project and have the entire veggie and annual flower section of the garden outfitted with a drip irrigation system. 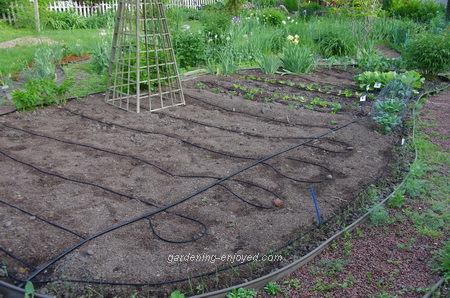 It works wonderfully and will keep all of the veggies flourishing with much less water than any overhead sprinkler would use. It was really very easy to install, which of course, made me kick myself for not getting around to it a few years ago. The warm weather and the lack of moisture was having real effects in the developing Perennial gardens. We accept that we spend 48 weeks taking care of our Peonies to enjoy their blooms for 3 weeks. The hot dry conditions were making them fall in less than a week. I gave up and ran the big sprinkler in the front yard for a few hours on Friday night. Big irrigation system in the back, sprinkler running in the front, Mother Nature thanked me for the help by providing torrential thunderstorms on Saturday. They started just as we finished doing all the flowers and decorations for an outdoor wedding. Enough moaning! There are wonderful things still happening. The picture looks like a head of Broccoli. It’s actually Asprabroc, a hybrid that first appeared in the late ‘90s in grocery stores but which Stokes now has in their seed catalogue. It produces many small heads and they can be cut every few days for 4 - 6 weeks. We ate the first ones on Friday night and they were wonderful. It was a treat to have something other than Asparagus for dinner, as delightful as that has been. The Asprabroc is similar in taste to Broccoli but has a milder, less bitter flavour. We are looking forward to more of it tonight. If it is as prolific as the catalogue promises our few plants should keep us happily fed for a while. The Napa or Chinese Cabbage, is also delicious but we are having to eat it early because the weather has made it start to bolt before it has formed much of a head. Chopped into a stir fry last night with some white balsamic reduction and a bit of heat, it was also delicious. You seem to enjoy stories of my disasters as well as my successes. This is one of those stories that happens quickly but seems to unfold in slow motion as it is happening. That’s a lovely Cactus in the picture, all clean and freshly potted. 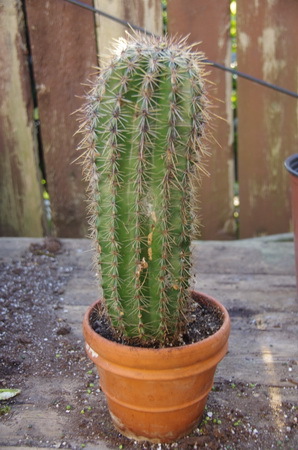 Why would I take the time to repot a Cactus in the busy weeks of spring. Over the refrigerator, there is a shelf that is under the glass roof of the solarium. It’s a great place to overwinter some plants that are part of the outdoor summer garden. That includes a couple of sharp spined Cactus. Having a half hour to spend, before I was to leave for some long forgotten errand, I decided to take down some of those plants and move them outside. There were also three Colocasia growing in buckets of water and a couple of other items. The first two Colocasia moved down and out without incident. The third one, with its large floppy leaves, caught on the Cactus thorns. Suddenly the Cactus was being dragged forward. The natural human reaction when something is about to fall, is to reach out and try to catch it. As my hand was arriving under the falling Cactus, the brain realized what it was and yelled at the hand to get out of the way. Too late. I now have a pot of water and its Colocasia in my left hand and my right hand is bleeding from the attack of several sharp Cactus thorns as I watch it hit the fridge, all of the soil spreads across the top of that appliance and for a considerable distance on the floor around it. The Cactus itself, devoid of any soil rolls across the floor. The half hour, that I had, is now used up and I need to leave but the fridge and kitchen floor are covered in soil and there is a bare root Cactus staring up at me. Will the Assistant Gardener get home before I do and find the disaster if I leave for my appointment? Should I just be late? Doesn’t the Cactus look lovely, freshly potted, and all of the blood has even been washed off it. The last thorn is working its way out of my hand. All’s well that ends well. Colette Asks? I am going to try planting seed potatoes in a blue recycling bin, like you suggested at the container gardening workshop. How many tubers per bin do you suggest and how deep should the dirt initially be in the bin? Thanks for your help. Ken Answers! A standard bin should be able to accommodate 4 potato pieces. Fill the bin about 1/3 full and bury the potato pieces a few cm in that soil and water well. Make sure the bin has drainage holes. Have Fun. Connie Asks? We attended your talk at Canada Blooms in the spring and found it to be very entertaining (as well as informative). Lots of good info regarding shade gardening that I'm implementing this year. Now I have a question on behalf of my 82-year old mother, a gardener, who is trying to lessen the amount of work she has to do re: hanging baskets. She is looking for a flowering annual plant that requires partial shade and will not drop its blooms. In the past she has had great success with dragon wing begonias but found the constant cleaning up of the dropped flower heads too much for her. Is there anything that you can recommend? Ken Answers! I think such a plant would be very successful. Unfortunately it would seem to go against Mother Nature. If a plant doesn't drop its older flowers it probably won't make any new ones. I had some nice Rex Begonias last year that we grow for the coloured foliage and thus no blooms to deal with. Some of the bright Coleus varieties would have the same properties.